The wall of a building under construction topples onto the workers below. The roof of a major store falls through after a heavy rain. A tent-like athletic facility collapses during a wind storm. These are examples of building or structure collapses, and the injuries resulting from them can be catastrophic — or even fatal — for anyone inside or nearby. And though the dangers of such events are quite obvious, the causes often are not. 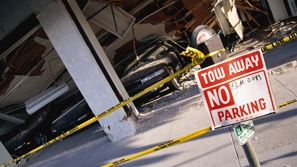 Some collapses legitimately may be attributed to natural events if the architect, builder, property owner, and manager have complied with all applicable design and construction standards. But, all too often, building or structure collapses can be attributed to factors such as faulty design, poor engineering, or improper maintenance. The attorneys at The Law Offices of Frank L. Branson are experienced at handling such complex cases. Our team of lawyers and experts will carefully investigate the accident to determine who was at fault and hold those parties accountable. Using our nationally renowned multimedia capabilities, we can create a compelling audio-visual presentation that will graphically illustrate how the accident occurred. In case after case, this type of persuasive evidence has helped our clients obtain the compensation they deserve. To learn more about our experience in collapsing building related matters, we invite you to contact the firm here.